There was a very big hole left in my life when I went vegan and could no longer have butter paneer at my local Indian restaurant. That buttery, creamy sauce was just so decadent and I didn’t know how I was ever going to eat Indian food again without being disappointed. Don’t get me wrong, I have found a few awesome vegan Indian dishes, but nothing that quite satisfies that butter chicken (or butter paneer) craving. If you’re a curry-lover, this is your heaven right here. This meal is so freaking flavourful and sooooooo so easy. If you put your rice on first, it will be ready by the time your rice is done cooking. Talk about a quick and easy weeknight dinner. I’ve tried veganising butter chicken sauce so many times before and there was always something missing. Eventually I stumbled upon some dried fenugreek leaves and that was it. The missing piece! You can get dried fenugreek leaves from Asian or Indian grocers and they’re also easy to find online. It’s native to Southwest India and grows well in tropical climates. You can buy it in a can, usually young and green (i.e. unripe), but you can also buy ripened jackfruit in a can (this is much sweeter). Young green jackfruit won’t make your curry taste like fruit. It actually has a completely neutral flavour, or slightly salty if you buy it in brine. It has a gorgeous soft texture that melts in your mouth. 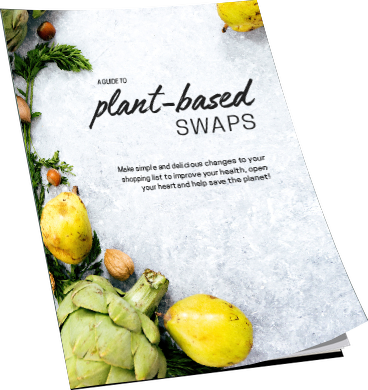 It’s super easy to digest and low in calories (not that we need to count calories when we eat mostly plant based whole foods!). If you’re wanting a high-protein meal, you might want to substitute the jackfruit for some firm tofu. But trust me when I say it won’t be quite as delicious. 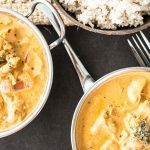 The jackfruit has a really amazing texture that is just perfect for this vegan butter chicken recipe! Did you know that a super common secret ingredient in a lot of Indian curries is sugar? I remember when someone first told me this and then I really started to notice how sweet some curries tasted (Thai food is bad for this too!). Stevia is 100% natural – extracted from the leaves of a Brazilian native plant – and it’s 100% sugar free. So it’s perfect for dropping into recipes such as this to get that sweet-savoury balance just right. But, be warned: it is NOT a teaspoon for teaspoon substitute for sugar. It can be up to 150 times sweeter than sugar, so you really gotta go easy with this stuff. I’m pretty darn sure you’re gonna fall in love with this recipe. Do let me know what you think! Add the rice to a medium pot with 2 cups of filtered water and a pinch of salt. Bring to the boil then reduce the heat to low and cook for 20 minutes with the lid on. Meanwhile, drain the jackfruit and use two forks to break apart the chunks of jackfruit into smaller, textured pieces. Heat 1 tablespoon of the coconut oil over low-medium heat and add the diced onion, stirring occasionally for 3-4 minutes. Add the garlic, ginger and spices and cook a further 2 minutes. Add the jackfruit, tomato puree, lemon juice, stevia, nutritional yeast and dried fenugreek leaves. 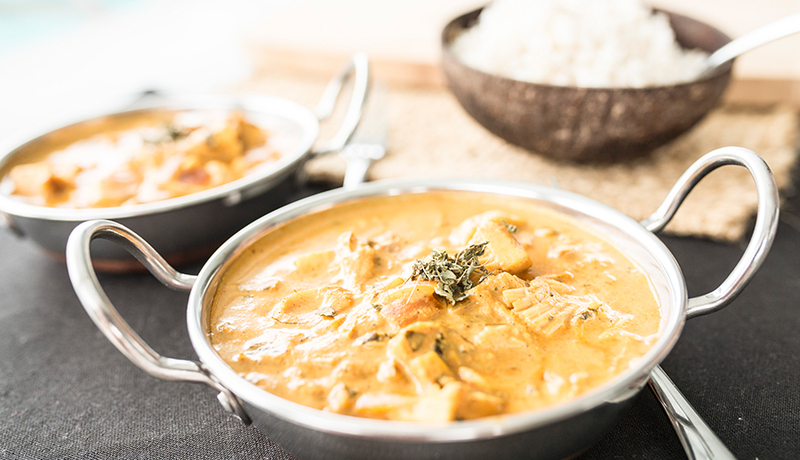 Increase heat slightly to bring the curry to a gentle simmer for 5-10 minutes. Add the coconut milk just 1 minute before turning off the heat (this helps to prevent it from separating, which can happen when coconut milk cooks for too long). Back to the rice - turn the heat off after 20 minutes and let stand for a further 5 minutes with the lid on. Split into 2 bowls with a little extra fenugreek leaves sprinkled on top to garnish. Serve with the rice and/or your favourite Indian sides and condiments. Delish-bomb. Would your people love this post?